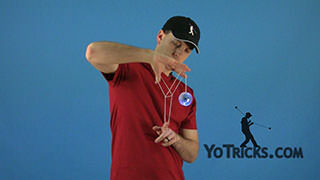 Learn how to do the Two-Handed Star Yoyo Picture Trick (aka Texas Star). 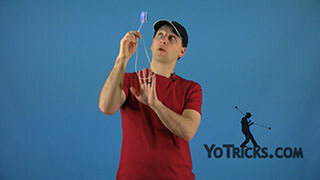 Two-Handed Star Yoyo TrickThis trick is called the Two-Handed Star, and it looks like this. If you find yourself having trouble with this trick because the spin on your yoyo is dying, we have a video on the Sleeper that will help you out with that. 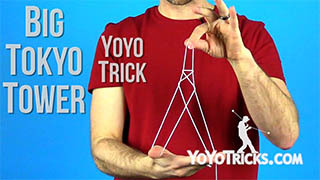 When you are first learning the trick, it is nice not to have all that pressure, so for now let’s just let the yoyo hang at the end of our string. The first thing you are going to do is take the thumb of your opposite hand, and you are going to bring it over and pull the string across, in front of your body. 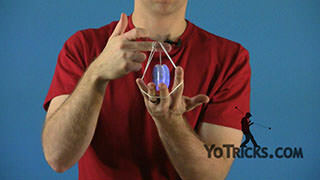 Thumb of your opposite hand, with it you are going to grab the string and pull it across your body. 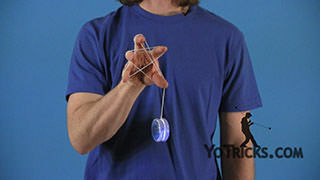 Then you are going to take the ring finger of your yoyo hand, and do the same thing. Bring it down, grab the string, and pull it across your body. 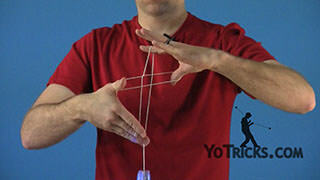 One more time, starting with your thumb of your opposite hand, bring it over and pull the string across. With the ring finger of your opposite hand, bring it down and pull the string across. Then you are going to take the pointer finger of your opposite hand and bring it down and lift the string up with the back of your finger. The string is going to be riding on top of your finger when you do this. You also want to make sure that the string is hanging in front of your star. If you find that it is hanging over this way just angle your finger over a bit. That way it is hanging in front. 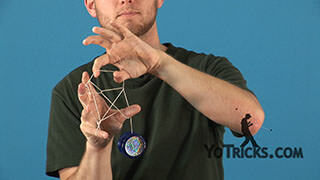 The next step is to take the thumb of your yoyo hand and put it through the middle of your star and pull the string through, straight towards you. The string is going to be riding on the back of your thumb. 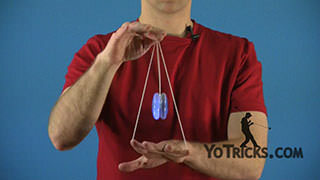 One more time, thumb of your yoyo hand, put it through the middle. Grab the string with the back of your thumb and pull it through. 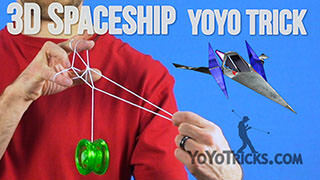 The last step is to take your yoyo finger. 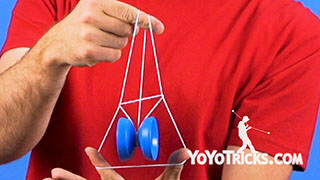 Bring it down in front of everything and with the back of your finger you are going to lift up the yoyo string. Then take your pinky and just sort of knock the string out of the way. It is just sort of riding on the top of your pinky. 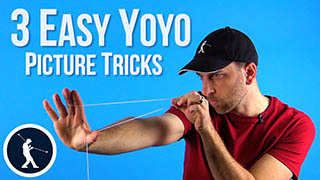 One more time with that last step, it is taking your yoyo finger, bringing it down in front, lifting up the string with the back of your finger and taking your pinky and holding the rest of the string out of the way. At this point you are just going to kind of shape your star. Sometimes you find… you are going to wonder where your top point is, that’s because you need to lower your fingers. Let’s go through that one more time. This time I am going to share with you some of the common problems people sometimes run into when they are learning this trick. Starting with the thumb of your opposite hand you are going to bring it over and grab it. When you grab it you want to make sure that the string is riding on the inside of your thumb. Sometimes people have a tendency to grab it with the back of their thumb. That is going to mess you up later on. Just be mindful with your thumb and make sure the string is riding along the inside of your thumb. 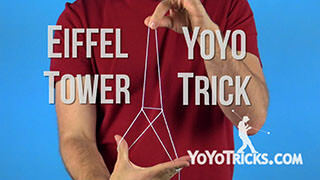 The same thing with the ring finger of your yoyo hand, grab it with the inside of your finger. Then when you take the pointer finger of your opposite hand, this time you are going to lift the string with the back of your finger, so this time the string is going to be on the top. 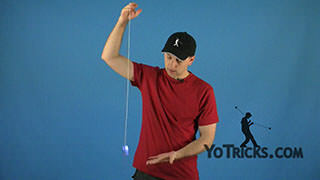 Then, the next step with the thumb of your yoyo hand, you are going to bring it through the middle of your star, and with the back of your thumb you are going to pull the string straight through, towards your body. 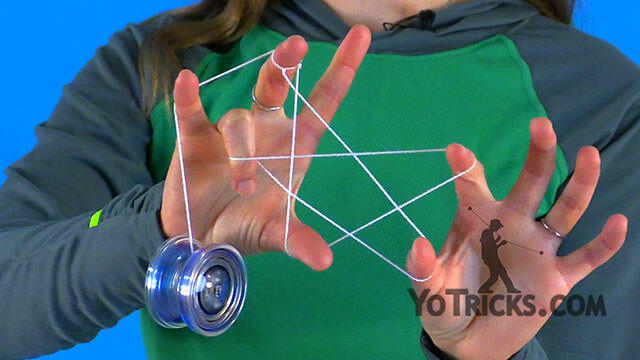 Then you are going to take your yoyo finger and bring it down and with the back of your finger you are going to lift the string. With the back of your pinky you are going to lift up the rest of the string and shape your star. It is kind of nice, you can make it wiggle, make it twinkle if you want to. 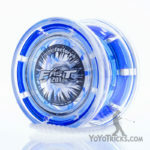 This time I am going to show you what that looks like with the yoyo spinning.